We often address the idea of “lost neighborhoods” in this column—places at the edges of Duluth’s built-up neighborhoods, or green spaces where nothing remains but a few footpaths and a pleasant stroll for you and the dog. It is thanks to the abandonment caused by turn-of-the-century booms and busts that we have so much green space in our city, unregulated by park rules or dominated by mowers. The county might rue those tax-forfeited lands, but the rest of us tend to enjoy them for what they have become. You would probably win a bet that no one, not even a lifelong West Ender, has heard of the neighborhood of Lyman Park. Look at Welbank’s Atlas of Duluth from 1912, however, and there it is, nestled in what is today a green triangle bound by the Lincoln Park Middle School property, West Skyline Parkway, and 27th Avenue West. Today, a lovely stretch of the Superior Hiking Trail traverses its northern section before the trail rejoins civilization on its way eastward. Lyman Park is what might be called a “paper neighborhood,” existing only on old plat maps. 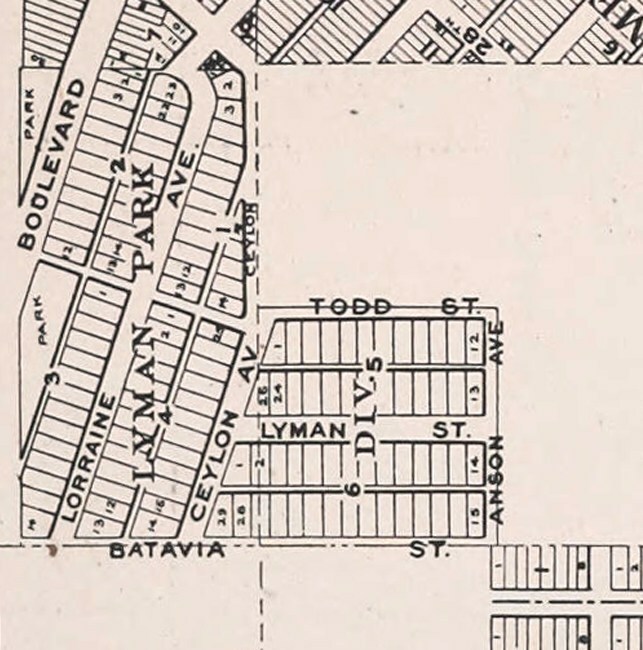 The current streets of Lyman Park include Lyman Street, Anson Avenue, Batavia Street and Todd Street. Lorraine and Ceylon Avenues, included in the plan, were never made. All were named by George N. Lyman Jr. and his older brother Ceylon E. Lyman, who were trying to make their family money grow. George Nelson Lyman Sr., the family’s patriarch, was the son of Asahel Lyman, who founded a mercantile business in Cortland, New York. George and his brother—also named Asahel—inherited the business, but both moved west after their father died, settling in Sheboygan County, Wisconsin. The Lyman Brothers soon found success, opening branch stores in Fond du Lac (Wisconsin), Calumet, Berlin, Ripon, and Sheboygan. Asahel also got into the shipbuilding business—one of them, a barque called the Cortland, cost over $65,000. Launched in 1867, it sank ten months later in a dramatic collision with the steamer Morning Star on Lake Erie. Both ships went down, and 38 people died. The Cortland was one of Lake Erie’s phantom wrecks until it was found again in 2005. George, meanwhile, spent most of his money getting into the lumber business. He bought thousands of acres of land in Wisconsin’s Douglas County and near Cook, Minnesota. As his sons Ceylon and George Jr. matured, they too joined the family lumber and real estate business, buying up pine lands all across the Old Northwest from a headquarters in Milwaukee. George Jr. joined the family business at age 18 as a bookkeeper, while his older brother ran the companies under his father’s tutelage. In 1889, the Lyman family and its lumber company moved to Minneapolis. George Sr. more or less retired, but continued to invest in real estate through the Lyman Land & Loan Company, which boasted $100,000 in available capital in 1890. The move was probably in part due to heavy wooing by Duluth’s C. E. Lovett, a developer of West Duluth, who enticed the Lymans into incorporating the Spirit Lake Land & Improvement Company. Lovett would act as vice president, with George Lyman Sr. as president and George Lyman Jr. as treasurer. The effort was to culminate in a development called Spirit Lake Park, with George Sr.’s brother-in-law S. T. McKnight as principle investor. Millionaire lumber baron McKnight balked when another partner spat on the deal as boosterism run amok, and his complaints led to some embarrassment on Lovett’s part. Eventually, the company sold their land to USS for its Minnesota Steel Company and became Morgan Park. George Sr. died in 1898 at the age of 81, one year after celebrating his golden anniversary with wife Elizabeth. His sons carried on, investing in grain, manufacturing, lumber and real estate. Ceylon led a diversification into mineral wealth in Texas, and bought a rubber and coffee plantation in Oaxaca, Mexico. He named the facility Batavia Plantation, after a town near Sheboygan Falls, his birthplace. 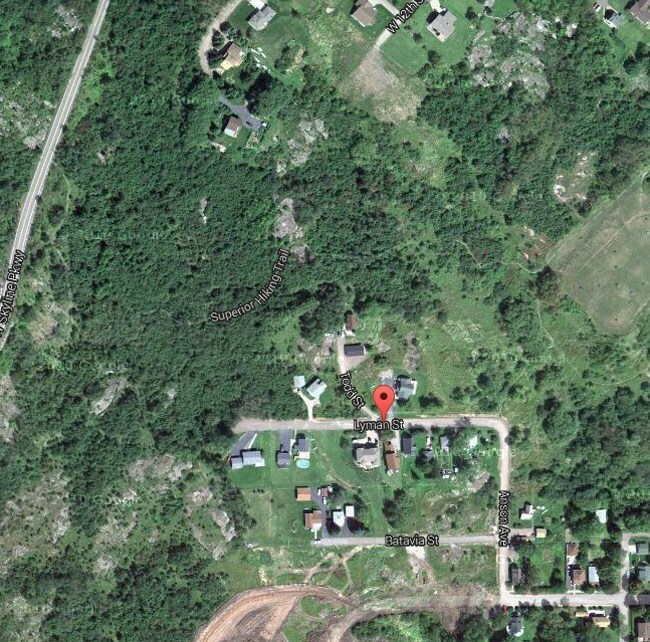 They also continued to buy land in Duluth, including property which was to become Lyman Park. Like most real estate developers, the Lymans named their streets for places and people that mattered to them. Lyman Street and the never-built Ceylon Avenue are obvious in their sources. Batavia Street is named for Ceylon’s Mexican plantation, which was as mentioned named for a village in Sheboygan County. Lorraine Avenue, also never built, was named for George Jr.’s only daughter with his wife Nellie. Anson Avenue is named for their sister Harriet Lyman Anson and her husband, Charles H. Anson, who may have invested some money into Lyman projects. The Ansons were prominent Milwaukee figures in their own right. Charles Henry Anson was a major in the Civil War, and he and his brother owned a highly successful grocery business in Milwaukee. He also served two years in the Wisconsin legislature representing Milwaukee’s seventh ward. The source of the name of Todd Street remains unclear, even after exhaustive family tree, map and census data searches. The only clue is that back in Ripon, Wisconsin, where the Lymans had a huge farm (and where the Lyman brothers grew up) an Englishman and day laborer named William Todd lived on the property with his family. By naming the street Todd, the Lyman brothers may have been honoring someone who cared for them as children. By 1917, there is some sign that the Lyman Brothers had overextended themselves. George Jr. advertised his “choice Lake Minnetonka home” for sale, noting that the owner was “going away.” Also that year, the Lyman Lumber Company stopped paying their property taxes on the many unsold lots in Lyman Park. Ceylon died in 1934 at the age of 84; his younger brother George Jr. died two years later at the age of 74. They are buried in the family plot in Lakewood Cemetery in Minneapolis, under a tall grey granite obelisk. Those must have been devastating years for the Lyman clan. Two months after the elder Ceylon’s death, his son C. Arthur Lyman was beaten to death at the age of 44 by striking truckers in the Warehouse District of Minneapolis. He was a leader of the Citizens Alliance, a group of union-busting business owners in the Twin Cities. During the historically significant Minneapolis Teamsters Strike of 1934, Lyman signed on as a special deputy to help the police fight the strikers, got involved in a melee, and was clubbed in the head. In 2012, Lyman’s name was added to the memorial for fallen police officers in Washington, D.C., an honor that some historians question.